I think every picture book author has a mental list of picture books he or she loves SO MUCH that the writer wishes he or she had written them. My personal “why-couldn’t-I-have-written-that” list has five books on it. * And one of them is Carolyn Crimi’s BORIS AND BELLA, an absolutely perfect tale of two ghouls — one a neat freak and the other a slob — who find friendship nonetheless. It’s fun to read and structurally perfect. I won’t tell you how many times I’ve tried to write a similarly structured book and failed. 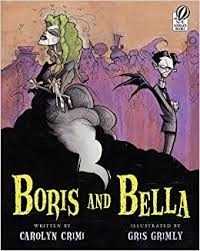 In fact, if you haven’t yet read BORIS AND BELLA, which is illustrated by Gus Grimly, you should go do so now and then come back to this post. No worries, I’ll wait. So I’m always excited when Carolyn has a new book out. And this past Tuesday, her THERE MIGHT BE LOBSTERS hit the shelves. It’s illustrated by Laurel Molk and published by Candlewick. As you might expect, it’s lovely. The book touches on fear, something every child (and adult) understands. But in this book, it’s a small dog named Sukie who’s scared, which automatically makes the book’s reader feel brave. Sukie is scared of the beach and everything that goes with it. Sandy steps. Bouncing balls. Salty waves. And the fact that, well, there might be lobsters. Sukie’s fears are so real and childlike and logical to her, that readers will hop right on board. There’s also Eleanor, Sukie’s patient owner, who coaxes her to try new things, but doesn’t judge her when she declines. And there’s Chunka Munka, a stuffed monkey who keeps Sukie company while Eleanor enjoys the beach. Will Sukie overcome her fears? Will she see a lobster? I know you want to know, but I’m not telling. This book is an classic story in the best sense of the word. There’s no edgy concept, breaking of the fourth wall or allegory for the reader to interpret. Just a loveable character, an understandable problem, the search for a solution with its attending failures, and an ending that solves the problem with heart and hope. Oh, and the writing is beautiful. There are a few lines that are so well executed, I stopped reading to admire them, And the characters are relatable. Everyone has been Sukie or Eleanor or both at different times. As a true test of quality, I read this to my husband whose literary tastes run more toward sports stories than children’s literature. He enjoyed it and spent the rest of the evening calling our cats Chunka Munka. So add this to your collection. If you’re a picture book writer, you just might end up wishing you’d written it yourself. 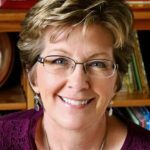 Carolyn Crimi, nonfiction picture books, Pat Zietlow Miller. Bookmark. I’ll have to look for this. I love that name–Chunka Munka! Great bunch of titles – and going to re-read “There Might Be Lobsters” because – what a fun book. Beautiful book. I can’t wait to read it. Congratulations, Carolyn! Thanks for sharing. These 2 books look wonderful and I can’t wait to read them! 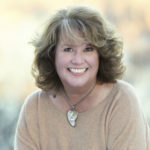 I love Carolyn Crimi books!!! I love Carolyn Crimi’s books. I just reread Henry & the Buccaneer Bunnies. OMG, what a blast. “Suffering sea dogs!…Great blimey bilges!” I’d never even heard of palm fronds until I read this book! Actually, an editor introduced me to CC’s work. Wonderful. Would love to take a class with her! Thanks for sharing. I’m adding these to my “to read” list! I look forward to reading both of these books. Thanks, Pat! 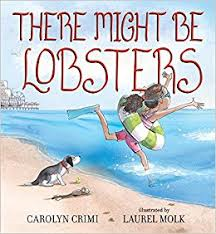 Carolyn Crimi’s books are wonderful! Putting it on my must-buy list for Whisp. Woods! Sounds like an awesome book to read with my granddaughters, Lily and Marley! What an awesome list. More great books to study and appreciate. One of my favorites, too, Pat. I love Carolyn’s books!!! I’m looking forward to reading both of these. Thanks for sharing. I love this book, Pat! Thanks for sharing and I’m excited to look up a few of your other recommendations that I haven’t seen! Sounds perfect! I’m looking forward to reading it.